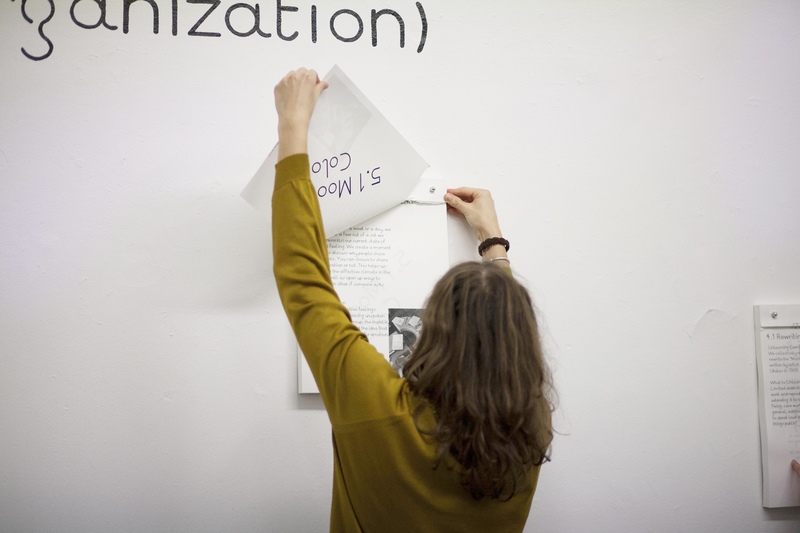 Annette Krauss & Casco Art Institute: Site for Unlearning (Art Organisation) is an ongoing, collaborative research project for unlearning specific organisational habits, behaviours and ways of thinking. Initially developed in 2014 by artist Annette Krauss (in partnership with Casco Office for Art, Design and Theory in Utrecht), the project takes the art organisation as a concrete site for research and subject for change, while placing emphasis on unlearning as a strategy, however unconventional, integral to learning something new. For Shapes of Knowledge Krauss and her colleague Ying Que will be in residency at MUMA to guide the museum through its own process of unlearning. By focusing on the relationship between the museum’s vision, its engagement in cultural production and day-to-day workings, Krauss’ Site for Unlearning (Art Organisation) project will ask MUMA to reflect on itself, posing the question: ‘what do we need to unlearn so that the front and the back of an institution operates together?’ Through a schedule of sessions with staff (including meetings, reading groups, furniture arrangement and cooking), focus will be placed on the notion of ‘business’; its causes, features and characteristics and the ways that ‘being busy’ can be ‘unlearned’. Existing within the lineage of institutional critique, Krauss’ project will manifest in a dedicated space within the gallery that makes visible the machinations of MUMA and the outcomes of its desire for self-reflexivity and experimentation. Dutch artist Annette Krauss addresses the intersection of art, politics and everyday life. Her work revolves around informal knowledge and normalisation processes that shape our bodies, the way we use objects, engage in social practices and how these influence the way we know and act in the world. Her artistic work emerges through the intersection of different media, such as performance, video, historical and everyday research, pedagogy and texts. Krauss has (co-)initiated various long-term collaborative practices (Hidden Curriculum / Sites for Unlearning / Read-in / ASK! / Read the Masks. Tradition is Not Given / School of Temporalities). These projects reflect and build upon the potential of collaborative practices while aiming at disrupting taken for granted ‘truths’ in theory and practice. Recent exhibitions include Regimes of Memorizing, Kunci, Yogyakarta, 2015/ Stedelijk Bureau, Amsterdam, 2014; In Search of the Missing Lessons, Whitechapel Gallery, London, 2013; (In)visibilities, The Showroom, London, 2012; and We are Grammar, Pratt Gallery, New York, 2011.